We're combining GM's first and second-generation G-series and GMC forward-control vans here for the sake of simplicity, as the overall design differences weren't extensive. 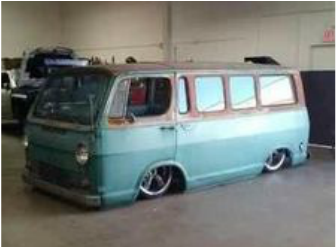 We'll discuss Corvair vans and ramp-side pickups, which were dropped in 1965, separately. 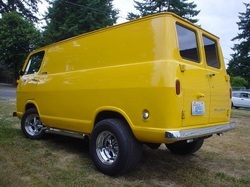 The first mid-engined vans from GM hit the market in 1964, available in short-wheelbase only, offering a six-cylinder platform derived from Chevrolet's compact Chevy II passenger car line. 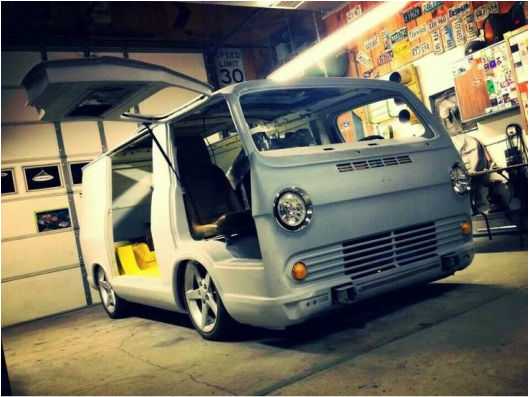 The first-gen G-Series vans could be had with side cargo windows or in a panel style. Distinguishing characteristics included a flat windshield, and headlights mounted like wide-open eyes similar that of the original Dodges, Fords, and their precursors, the VW buses. 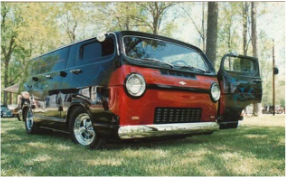 1967-1969 brought the 2nd-gen GM vans with curved-glass windshields and headlights dropped down into the lower front grill, just above the bumper. Tail lights were also redesigned from 67 on, becoming rectangular as opposed to the capsule-shape of the 1st gen's tail lights. The second generation Chevys and GMCs was the first to offer a V8-option as well as a long wheelbase model. Note the headlight placement, the slight curvature of the front windshield, and the optional long-wheelbase. 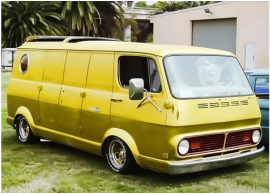 Those are the distinguishing features of the 2nd-gen vans from General Motors, which could be equipped with 283 V8s, and later the 307. 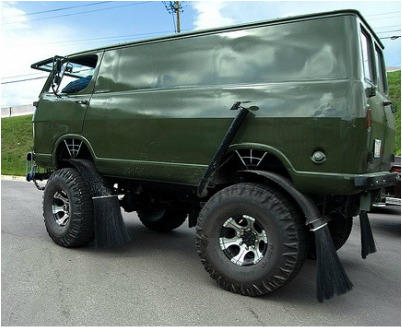 Wheels, flares, and suspension mods were the most common 1st-gen custom mods, although chopping was occasionally done. You'll want to think twice about lowering the roof of a first-gen, as seat height and headroom can be adversely. Even lowering the front end of a first-gen can be tricky, as the front wheel wells are also where the front seats mount and the need for wheel travel prevents you from going much lower before you have to alter the wheel wells. And if you're ambitious enough to do that, you sacrifice an inch of headroom from every inche you raiser the wheel wells. Think twice if you're tall or building a van that will be driven regularly.